Tour Confidential: After seeing Tiger at Torrey, are your expectations higher or lower for him this week at Riviera? GOLF.com conducts a weekly roundtable with writers from Sports Illustrated and GOLF Magazine. Check in every Sunday night for the unfiltered opinions of our writers and editors and join the conversation by tweeting us @golf_com. 1. Tiger Woods will play the Genesis Open at Riviera this week in his second Tour start this year. Now that we've seen him finish in the middle of the pack in the Bahamas and T-23 at Torrey Pines, how have your expectations changed for Woods, and what should we expect from him this week in SoCal? Michael Bamberger, senior writer, Sports Illustrated: A very difficult golf course for him, much harder than Torrey. If he drives it that poorly again, he'll have no chance of making the cut. Jeff Ritter, digital development editor, GOLF.com (@jeff_ritter): Tiger's comeback is off to an encouraging start, but he hasn't played this event since '06. As Bamberger says, Woods won't be able to rely on guile and experience if his long game betrays him like it did at Torrey. I'd probably give him 50-50 odds to make the cut, but the most important thing is continued good health while slowly tightening his game. Sean Zak, assistant editor, GOLF.com (@sean_zak): It's worth noting that while there was hype for Tiger to play the Genesis last year, he didn't, which means he hasn't played Riviera in competition in more than a decade. As far as driving the ball goes, he can't get much worse than he did at Torrey, but the newness of that course (to him) should make things difficult. Dylan Dethier, associate editor, GOLF.com (@dylan_dethier): I've talked myself all the way back in on Tiger. He can't hit it any worse than he did last week, and if he chips and putts it nearly as well? Nah, he won't win, but we'll be seeing TW in the mix come Sunday. Josh Sens, contributor, GOLF Magazine: I'll lean on my same pre-Farmers Tiger assessment: he will hit enough good shots to give the optimists hope and enough poor ones to give the doubters cause for skepticism. But I agree with Bamberger. The same long game as Torrey and he'll be finished on Friday at Riviera. That sticky rough is a whole different animal. The Houdini act he pulled in San Diego will not work here. 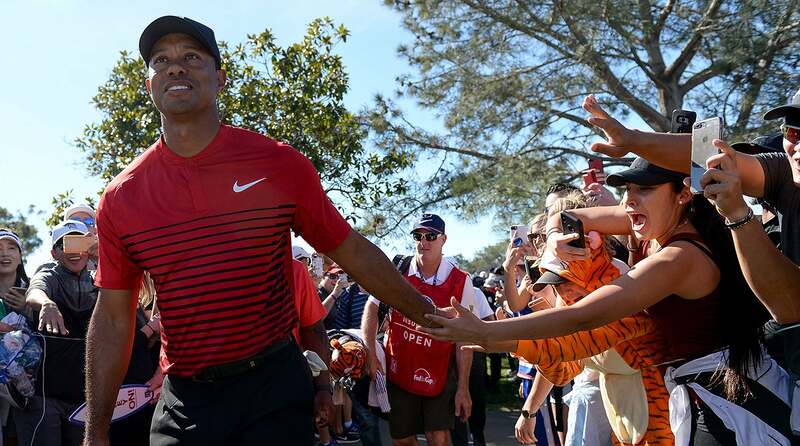 Alan Shipnuck, senior writer, Sports Illustrated (@alanshipnuck): What adds dramatic tension to all of this is that nobody knows how Tiger will play...not even Tiger. Should be fascinating to watch, yet again. John Wood, caddie for Matt Kuchar (@johnwould): Despite not hitting it anywhere near as well at Torrey Pines as he did in the Bahamas, he scored, and I think that will give him some confidence heading to Riviera. The thing about Riviera is that Tiger won't have to hit many drivers. He is still as good a tactician as this game has ever seen, and if the driver isn't working he can still get around hitting 3-woods and two-irons all week. I do think he will drive it much better, but even if he doesn't I think he can still put up a good score. I wouldn't be surprised at all with a top 10. 2. Woods has not revealed which events he intends to play beyond this week, though he is listed as a "maybe" on the early field list at the Valspar Invitational at Innisbrook. Where do you expect we'll see him compete next? Bamberger: I would think Honda, in his backyard. Zak: At this point, it would seem he's ready to turn in some consistent tournament reps. I'd be shocked if he doesn't play the Honda, though that'd be his first time playing back-to-back events in this comeback version 4.0. Dethier: I would love to see Tiger at the Valspar, in a field that isn't comprised solely of the world's elite. Heck, I'd love to see him tee it up at the Minor League Golf Tour down the road from him this week. Get the man some reps! Sens: I second Ritter's equation but am not familiar enough with my keyboard alt functions to retype it here. Shipnuck: When is the Seminole Pro-Member? Wood: A wild guess, but I'd say Valspar and Bay Hill. 3. Phil Mickelson finished off a solid week at Pebble with a 67 Sunday to finish in second place at 14 under. We've seen him finish T-5 last week in Phoenix and T-3 at the Safeway Open to begin the season. Lefty hasn't won since the 2013 British Open, but at 47 he's playing well enough to regularly contend. What do you surmise is Mickelson's peak at this point in his career? Are we seeing it right now? Bamberger: Oh, no. Phil could win again in any given week. Phil could win at Augusta any given year for at least five years to come. He remains a spectacular talent and the game still seems to interest him. Ritter: If he can finish top 5 he can certainly win again. He looks healthy and recharged so far this year and I think a W is coming soon...dare I say, maybe in about eight weeks at Augusta? Zak: I'm in awe of Phil. Every year I convince myself that it's time for him to give up the streak of Ryder Cups and Presidents Cups, but every year he does this — he drives is "well enough" to use his incredible ball-striking and short game and get into contention. That being said, he can wrack up a bunch of top-5s and I'll still be patiently waiting for him to make a clutch 12-footer on a Sunday tied for the lead. Dethier: That was truly a masterful backdoor runner-up finish, joining a few of the world's elite (DJ, Jason Day, red-hot Reavie) at T2. He's been playing really well from behind, and he's clearly got the game to win. But let's see him in a final group, in the mix. I don't think he wins again, and I look forward to being proven completely wrong. Sens: As they say in the NFL, on any given Sunday. Phil is still capable of winning anytime it pegs it, but a big time win is more likely at Augusta than anywhere else. Shipnuck: It seems like even on his good weeks now Phil has one mediocre round — at the Pro-Am it was his Saturday 72, during which he made only one birdie. I don't know if the issue is physical or mental. To finally win again he'll need four good ones in a row. Wood: I honestly think Phil is swinging it better than he ever has, and he doesn't seem to have lost any flexibility or short game skill. He can still hit it plenty long, and he's got more guts than most. It's remarkable to see a 47 year old who has never really had a slump, who isn't necessarily making a comeback. He is entering his 25th YEAR inside the top 50 in World Ranking. Say that out loud. 25 YEARS in the top 50 in the world. That's crazy. He can win any week, any course, and while I'm sure he'd like to get into the winner's circle before Augusta, I'd expect him to be as confident as anyone entering the Masters and the U.S. Open. 4. Earlier in the week Jason Day discussed Rory McIlroy's ability to lap a field when on his game, but questioned his desire a bit, saying, "I think the biggest thing for Rory is the desire part, how much do you really want it, because he has the tools to be kind of Tiger-esque." We've seen others question McIlroy's desire in the past, and though he answered definitively on his own Wednesday, Rors missed the cut at Pebble. Is Day's perception of Rory's desire a fair observation? Bamberger: I have the opposite impression of McIlroy, that he may want it too much, and he is seeking balance in his life because he has seen up-close (Tiger Woods) what can happen when it is not there. Ritter: Rory has had a lot going on off the course — a lawsuit against his old management company, high-profile gear changes, injuries and a wedding among other things. I think Rory's slump is more attributable to distractions, and poor health, rather than desire. I put no stock in the Pebble MC. This still looks like a Revenge Season for him. Zak: I'd be careful calling it a slump, or looking into his Pebble performance too much. He'd never played the event before. Whether or not Day is on to something, it does seem a bit irresponsible (and not to mention hypocritical) for him to question another player's desire. Until Rory comes out and says "Nah, didn't really want to play" during a big event, I'll go on assuming he's got plenty of desire to win professional tournaments. Dethier: Rory's going to have a big week at Riviera and we’ll all be back on board the McIlroy hype train. Sens: The fact Rory himself did not dismiss Day's comment suggests that there's something to it. Not everyone is cut out for the kind of single-minded focus we saw from peak Tiger. It's only natural for intensity and drive to wax and wane. But I do believe Rory when he says he's back into it. And I wouldn't attribute this weekend's MC of a sign of any lack of inner fire. He had a bad week. It happens. Shipnuck: Don't forget that Rory turned pro as a teenager — he's a very old 29. It's natural for all of these guys to have periods where the desire to practice and prepare wanes a bit. But I liked Rory's comment that he wants to retire as one of the all-time greats. That tells me the fire is still burning inside of him. Wood: He's got four majors. Jason, Justin (both of them) have one. So too Dustin, Sergio, etc. etc. etc. Jordan is the only other young player with more than one major, with three. The comments are misguided. He wants and will win more. 5. A 52-year-old amateur named Julio Bell played in the Colombia Championship this week on the Web.com tour and shot 56 over, eventually DQing himself after failing to turn in his scorecard. It was loosely reported that Bell paid for his spot in the field, and after shooting 93-105, he drew much ire from players both in the field and not. Following Steph Curry's performance in August, and Tony Romo's exemption into a Tour event next month, where do you draw the line on what is an acceptable exemption and what isn't? Bamberger: I don't care what your name is, if you play poorly enough to shoot 152 for 36 holes you absolutely should not be given a spot into a Tour or Web.com event. These are athletic competitions. Ritter: This Julio Bell story reminds me a little of Eddie "the Eagle" Edwards, the British ski jumper who was wildly in over his head but still competed in the '88 Winter Olympics, finishing last by a mile. But unlike Bell, Eddie the Eagle became a folk hero along the way. So here are two suggestions that should work out well for everyone: Golf tournaments should give sponsor's exemptions to guys who can actually play, and Julio Bell should quit golf and take up ski jumping. Zak: Bell is hopefully the worst result we'll ever get from a sponsor's exemption. Tournaments (and tours) can quickly draw criticism with these decisions, so unless it's a sure-fire player who can actually compete, it's best to save those spots for people who can actually compete. I'm really hoping Romo can make it to the weekend. Dethier: Thanks to increased scrutiny from golf's internet hawks, the long-shady practice of sponsor's exemptions is getting a lot more scrutiny. Honestly, I have no problem with giving a fair amount of latitude to sponsors of lower tier tours -- they’re paying up, after all. But breaking 80 would be a solid start. Then again, our guy Bell (who goes by "The Machine") certainly drew more than usual attention to this week's event. Blessing in disguise? Sens: I'm not sure how you draw a hard fast line. Someone paying their way in is clearly beyond the pale. But then you get a case like Curry, who was dismissed by many as a publicity stunt before he teed it up last year and then turned out to be the biggest draw all year on that tour. He's a rarity of course but there was no way to know without taking the risk. Shipnuck: Steph and Romo will bring tons of eyeballs to otherwise low-wattage events and they make golf a little bit cooler and add to the mystique of the Tour pro, because these elite athletes get crushed by the real golfers. Whereas Bell is just a bad golfer with no other redeeming value to the field. He never shoulda been there. Wood: Curry and Romo can play. This guy obviously couldn't. If I'm a tournament director and I can make the news and get my tournament mentioned in media it otherwise wouldn't have been, and it's not making a mockery of the sport, then it's their right to grant those exemptions. I don't buy into the "he's taking someone else's spot" argument. Exchanging texts with La Maquina, appreciate him responding. 6. Jim Nantz' backyard par-3 at Pebble (an inland replica of the famed 7th) was put on full display this week when his broadcast buddy Nick Faldo made an ace and shared it for all the world to enjoy on Twitter. What is the coolest hole you've played that wasn't attached to a golf course? Ritter: At Casa Ritter back in the day, my brother and I would knock wedge shots off a hill in our backyard and aim them a birdhouse. Eventually the birds moved out. Zak: I once teed up a ball on the roof of my Upper East Side apartment, ripping driver in the direction of the East River. As far as I know I made an ace. Dethier: The woods behind my parents house are positively littered with golf balls. For some reason our lawnmower, even on its lowest setting, never got the yard stimping quite to my satisfaction, but that wasn't for lack of trying. Sens: Technically, all the holes were part of the same course. But the holes on the Nullarbor Links are stretched some 800 miles across the Australian outback. It took my a week to play them all. Those were wild and weird. With kangaroos bounding around, and death adders slinking around in the brush. Shipnuck: I've played Nantz' backyard par-3. It was just the two of us, after a long breakfast with a third fellow who wanted to discuss a book project. Upon reaching the tee, Nantz called down to his wife Courtney and asked her to put on "the music" and suddenly the Masters theme song was blaring from unseen speakers. Nantz narrated a few of my shots and it was surreal, to say the least. There were five flags in the green. We played three balls to each pin position, with a winner being declared for each flag. We split the first four. The final pin position was the hardest — back left. We each hit one really good shot. Nantz actually got on his knees to measure and he beat me by a couple of inches. It still stings. Wood: In high school, me and my buddy Geoff Griffin, who would go on to star at Fresno State, would practice a lot at local high school fields with shag bags. At the end of the sessions we would put on our course designer hats and take turns designing holes to play. Sometimes having to get the ball to touch home plate on the baseball field 500 yards away using only a seven-iron, sometimes having to flop the ball into a trash can 20 feet away. We would usually put limits on the clubs you could use or the shots you had to play, and that was some of the most fun I've ever had playing golf.